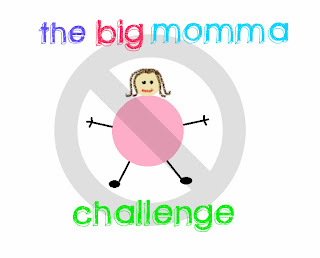 notSupermum: Still going: The Big Momma Challenge week 20! I can hardly believe it's week 20! I think this is the longest I've ever stuck to a healthy eating regime even though it hasn't all been plain sailing. I've had a few weeks when I've gained weight, and a couple where the weight remained the same. But overall the trend has been downward, and this week was also a good week with a 3lb loss. That brings my total weight loss so far to 23lbs, and I'm determined to keep plugging away at it. I think the reason I'm still going is because this definitely is Not A Diet! It is a new, healthier lifestyle where I can still eat the same things I always eat but I'm more aware of portion control and taking a healthy option where one is available e.g. jacket potato instead of chips; a piece of fruit instead of a biscuit. ﻿﻿﻿﻿﻿﻿The next few weeks are going to be tricky due to a weekend away in Milan (and of course I will be trying out all of those delicious Italian foods, it'd be rude not to! ), a meal out at a restaurant for my 50th birthday and then not long after that it'll be Christmas but I'm not going to fret about it. I'm going to enjoy these special occasions - after all, you're only 50 once! I'm not expecting to lose a whole lot of weight during December, but if I can maintain where I am now that would be a big success for me. ﻿﻿﻿﻿If you'd like to join in with the Challenge please leave a comment below and add your blog post to the linky below (please link back to me in your blog post too). Set yourself a target for the week, and then let us know how you got on at the end of the week. I'd love to hear about your efforts and successes, and other people can visit your blog to offer support to. Good luck! Hope you all had a good week.